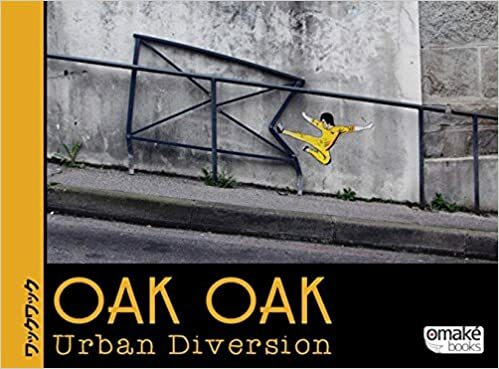 Urban Diversion, by Oak Oak. Omaké Books (France). Trilingual French/Japanese/English. $27.50. Jeff says: Oak Oak is a street artist from St. Etienne in France whose medium is the wasteland of modern cities—not the glamorous downtowns, but the monotonous, crumbling banlieues. Here he finds the potential for humor, for humanity, for art. Like Banksy, if caught he would surely be arrested for “defacing” public spaces, but in fact it’s the opposite: he puts a human face on them. Urban Diversion was suggested to us by a customer, Carolyn Phelan, but alas, there were no copies of this book obtainable in the United States. So we scavanged a few copies from a bookstore in Germany and are making them available in our store. A children’s book? Absolutely! Jeff says: Austrian writer Heinz Janisch is one of the most prolific and versatile writers for children in German-speaking Europe. In Wie war das am Anfang . . . ("What happened back when . . . "), his poetic text is paired with the equally evocative images of artist Linda Wolfsgruber to answer a child's question: why was I born a human child instead of as a tree, a polar bear, a leaf, or a boulder? It is as gentle an introduction into the broadest questions of life--and the power of poetry--as a parent might wish for a child, and as a child might hope to read or have read to her. Ages 2 - 8. $15.